A Polish émigré who fled the Nazis and settled in America, Sala Galante Burton succeeded her husband, the powerful California Representative Phillip Burton, after he died suddenly in 1983. In the House, Congresswoman Burton championed many of the same interests she had worked for during her decades as a leading figure in the California Democratic Party: civil rights, women’s reproductive rights, the environment, and world peace. Sala Galante was born in Bialystock, Poland, on April 1, 1925, daughter of Max Galante, a Polish textile manufacturer. With her Jewish parents she fled from Poland in 1939 at the age of 14, just before the Nazi invasion and occupation. “I saw and felt what happened in Western Europe when the Nazis were moving,” Burton recalled years later. “You learn that politics is everybody’s business. The air you breathe is political—it isn’t just a game for certain people. We must all be vigilant in terms of whom we elect to office, vigilant in terms of our civil rights and liberties.”1 She retained those memories and a hint of her Old World accent for the remainder of her life. She attended public schools in San Francisco, and studied at San Francisco University. From 1949 to 1950, she was associate director of the California Public Affairs Institute. Galante also worked with the National Association for the Advancement of Colored People in its efforts to eliminate job and housing discrimination. Sala Galante met her future husband, Phillip Burton, at a California Young Democrats convention in 1950. They married three years later and raised a daughter, Joy, whom Sala Burton had from a previous marriage that had ended in divorce. In the 1950s, Sala Burton embarked on an active political career that paralleled her husband’s rise to influence in state and national politics. She had a lighter, more genial touch than her husband’s sometimes brusque approach to issues. Phil Burton, who lost a race to be House Majority Leader in 1976 by one vote and was regarded as the dean of California politics, often referred to her as his better political half, “the popular Burton.” He added, “I keep Sala busy repairing all the fences I’ve busted.”2 She was a founder of the California Democratic Council and served as its vice president from 1951 to 1954. 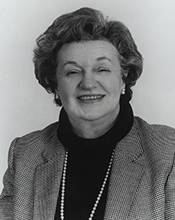 Burton presided over the San Francisco Democratic Women’s Forum from 1957 to 1959 and was a member of both the San Francisco County and California State Democratic Central committees. She also was a delegate to the Democratic National Conventions in 1956, 1976, 1980, and 1984. In 1964, when Phillip Burton won the first of 10 consecutive terms to the U.S. House from a San Francisco district, the Burtons moved to Washington, D.C. In Washington, Sala Burton served as president of the Democratic Wives of the House and Senate from 1972 to 1974. Eight days after Phil Burton died suddenly in April of 1983, Sala Burton announced her candidacy to fill her husband’s unexpired term as Representative for his San Francisco district. She told supporters, “I will continue in his footsteps.”3 She also minimized gender issues in the campaign. “I’m not running because I’m a woman,” Burton told voters during her campaign. “I’m running because I think I can do more in Congress than anyone.”4 Her main competitors were Democratic attorney Richard Doyle, Republican real estate broker Duncan Howard, and Republican Tom Spinosa, who had lost several campaigns to Phil Burton. While her husband used the telephone to gather support, as if it were “an extension of his body” by one aide’s account, Sala Burton was a tireless door–to–door campaigner. “I want to go everywhere, she said. “I want to feel like I’ve earned this.”5 Turnout was light at the June 21 special election (less than 30 percent), but Burton won 55 percent of the vote in a field of 11 candidates; Howard finished second with 22 percent. In her two re–election campaigns Burton was never seriously challenged, winning 72 percent against Spinosa in 1984 and 75 percent against Republican Mike Garza in 1986. When Sala Burton took her seat in the House on June 28, 1983, she received her husband’s assignments on two committees: Education and Labor and Interior and Insular Affairs. She also received an assignment on the Select Committee on Hunger during the 98th and 99th Congresses (1983–1987). In the 99th Congress, after failing in a hard–fought effort to win a seat on the prestigious Appropriations Committee, Burton dropped her Education and Labor and her Interior assignments to get a seat on the influential House Rules Committee. She served there through the remainder of her time in Congress, working on the Subcommittee on the Legislative Process. In the final year of her life, Sala Burton battled cancer, undergoing surgery in August 1986. Though she easily won re–election to the 100th Congress in 1986, she was too ill to take the oath of office on the House Floor and, by special resolution, was sworn in at her home by California Representative Don Edwards. The following day she entered the hospital. In her final weeks, much the same way that Phil Burton had supported her as a successor, Sala Burton said that when the seat became vacant, she would support the candidacy of her campaign chairwoman, Nancy Pelosi. Burton died in Washington, D.C., on February 1, 1987. Sala’s death brought to a close the “Burton era” in the House, since in 1983 Phil had died and his brother, John, had retired from a neighboring congressional district. 1Martin Weil, “California Democratic Rep. Sala Burton Dies,” 2 February 1987, Washington Post: E6; Barbara Gamarekian, “‘The Popular Burton’ and Her Mission,” 29 July 1983, New York Times: A10. 4“Widow of Rep. Burton Is Elected in California Congressional Race,” 23 June 1983, New York Times: A16. 5Jay Mathews, “Female Politicians Gaining Power in San Francisco: Phillip Burton’s Widow Likely to Win Today,” 21 June 1983, Washington Post: A3. 7“Sala Burton: Congresswoman Was 61,” 1 February 1987, United Press International. 8Dan Morain, “Rep. Sala Burton, Who Replaced Husband in Congress, Dies at 61,” 2 February 1987, Los Angeles Times: 3. 9“Sala G. Burton,” Associated Press Candidate Biographies, 1988. Papers: 1983-1986. 6.25 feet Correspondence and other routine working files from Sala Burton's tenure in the U.S. House of Representatives. Correspondence is chiefly incoming from other Members of Congress, friends, constituents, and organizations. Also includes press clippings and releases, election files, subject files, legislative and voting records, photographs, audio cassettes, and videocassettes. Finding aid in repository. Restricted. Advance notice required for access. Papers: In the Philip Burton papers, 1945-1986, 43 linear feet. Persons represented include Sala Burton. "Sala Galante Burton" in Women in Congress, 1917-2006. Prepared under the direction of the Committee on House Administration by the Office of History & Preservation, U.S. House of Representatives. Washington: Government Printing Office, 2006.